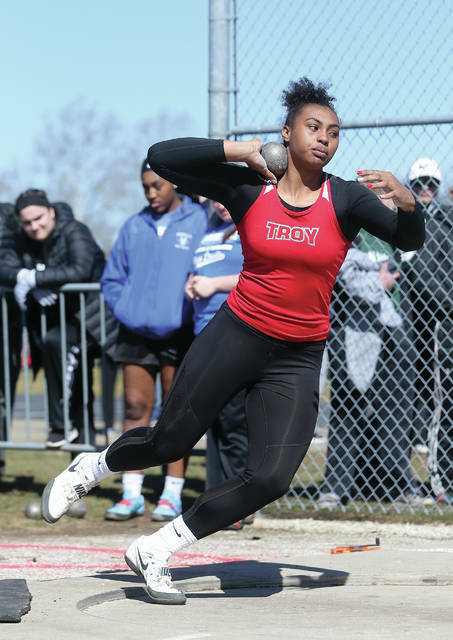 Lee Woolery | Miami Valley Sunday News Troy junior Lenea Browder won both the shot put and discus, while also setting meet records in both events, Saturday at the Up and Running Invitational at Troy Memorial Stadium. Lee Woolery | Miami Valley Sunday News Troy senior Jaydon Culp-Bishop took second in the 100 Saturday at the Up and Running Invitational at Troy Memorial Stadium. Lee Woolery | Miami Valley Sunday News Troy freshman Emma Kennett won the 3,200 Saturday at the Up and Running Invitational at Troy Memorial Stadium. Lee Woolery | Miami Valley Sunday News Troy’s Jesse Westmeyer throws the discus Saturday at the Up and Running Invitational at Troy Memorial Stadium. 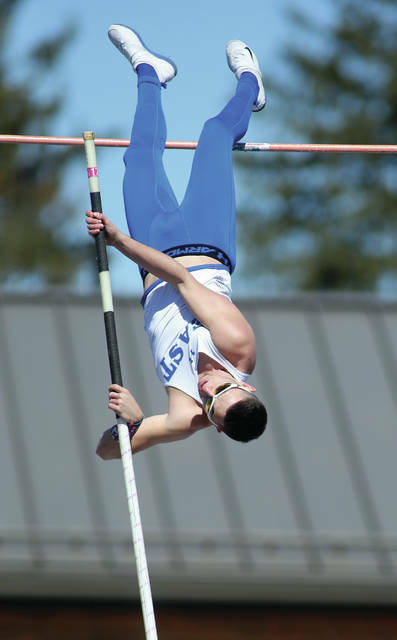 Lee Woolery | Miami Valley Sunday News Miami East senior Blaine Brokschmidt took second in the pole vault Saturday at the Up and Running Invitational at Troy Memorial Stadium. 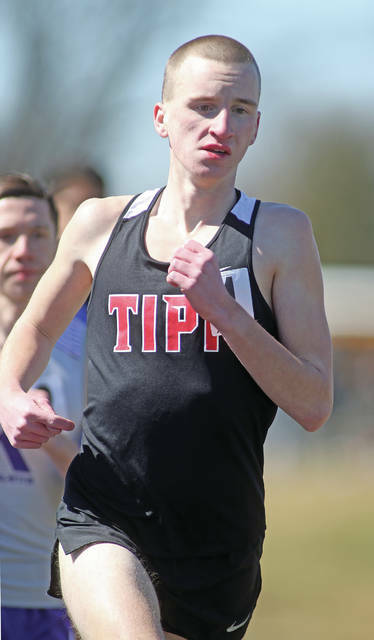 Lee Woolery | Miami Valley Sunday News Tippecanoe junior Bryce Conley won the 3,200 Saturday at the Up and Running Invitational at Troy Memorial Stadium. 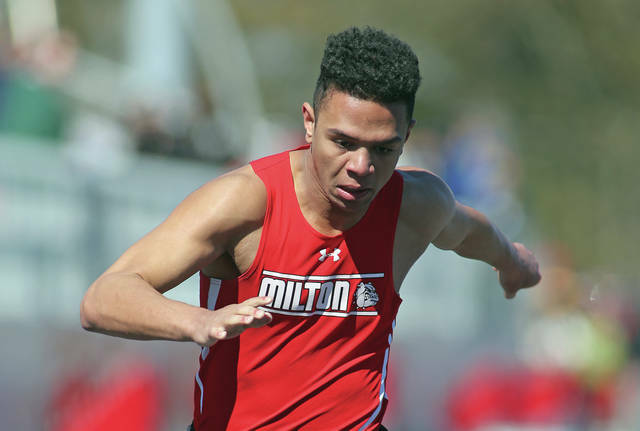 Lee Woolery | Miami Valley Sunday News Milt0n-Union’s Robbie Grove took third in the 200 Saturday at the Up and Running Invitational at Troy Memorial Stadium. Lee Woolery | Miami Valley Sunday News Troy senior Annah Stanley placed second in the long jump Saturday at the Up and Running Invitational at Troy Memorial Stadium. 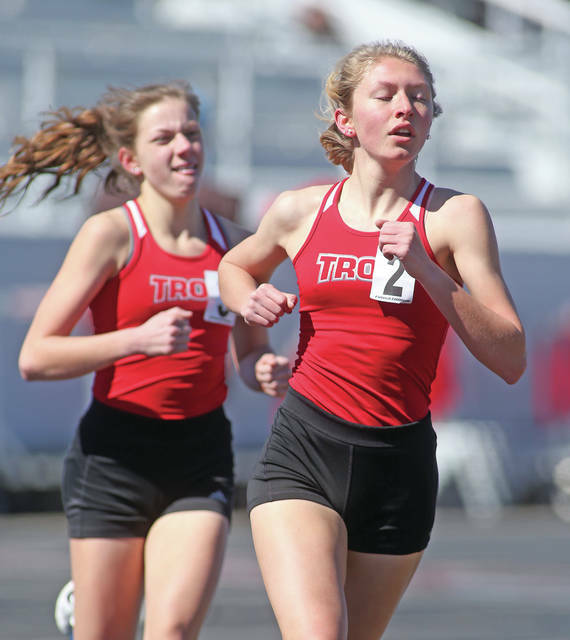 Lee Woolery | Miami Valley Sunday News Troy’s Olivia Tyre (right) and Dinah Gigandet both placed in the top four in two events Saturday at the Up and Running Invitational at Troy Memorial Stadium. Lee Woolery | Miami Valley Sunday News Troy senior Lilli Cusick placed third in the pole vault Saturday at the Up and Running Invitational at Troy Memorial Stadium. 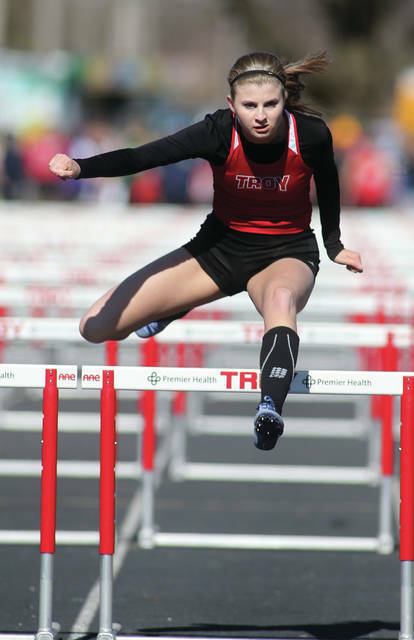 Lee Woolery | Miami Valley Sunday News Troy senior Jessica Goodwin placed second in the 100 hurdles and fourth in the high jump Saturday at the Up and Running Invitational at Troy Memorial Stadium. TROY — In 100 years of track and field at Troy High School, there’s never been anyone like Lenea Browder. There may never be anyone quite like her ever again. 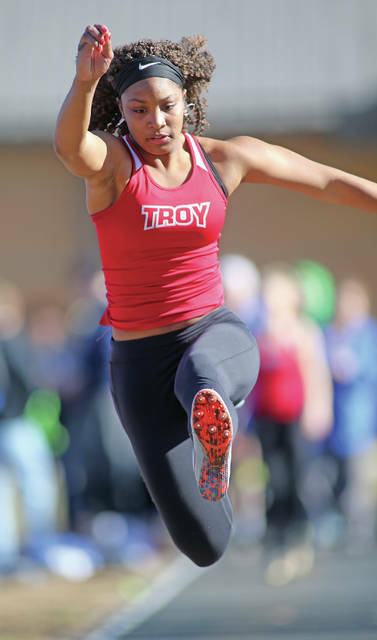 On a day in which the Trojan track and field teams opened the 2019 season and celebrated the 100th anniversary of the program, Browder — Troy’s junior shot put and discus thrower — again showed why she might be the best track and field athlete in school history. Browder, who already owns one state outdoor championship in the discus, a state indoor title in the shot put and an outdoor state runner-up finish in the discus, soared past both her competition and the meet records Saturday in the Up and Running Invitational at Troy Memorial Stadium. Browder’s most impressive performance of the day came in the discus, which she won with a throw of 154-11, more than 55 feet better than the nearest competitor and 30 feet better than the previous meet record of 124-10, set in 2016. She won the shot put with a throw of 41-1, breaking the meet record of 38-2, set by Milton-Union’s Beyonce Bobbitt in 2017. Troy’s only other event champion on the day was freshman Emma Kennett, who won the 3,200 in 12:00.39. Still, though, Troy was able to rely on its depth to run away with the team championship. Despite not having three of its top five sprinters available, Troy finished with 133.5 points, while Fremont Ross was second with 80 and Chaminade Julienne was third with 78.5. In the event’s five-year history, the Troy girls have won every year. “You always want to win at home,” Troy girls coach Kurt Snyder said. “You always circle your calendar for the home meets. It’s important to the kids. Their friends are here to watch. Their parents are here. I think it was even more special with us celebrating the 100th anniversary of the program and having a lot of alumni come back for this. We wanted to show them that what they started, we want to try to continue. Being a part of that tradition is really neat. Troy had a number of girls place in the top four in their respective events. Senior Olivia Tyre placed second in the 1,600 (5:31.94), while teammate Dinah Gigandet, a sophomore, placed third (5:33.64). In the 800, Tyre was third (2:31.69), while Gigandet was fourth (2:33.27). Freshman Hannah Falknor placed second in the 200 (26.49 seconds) and third in the 400 (1:02.90). Senior Jessica Goodwin placed second in the 100 hurdles (16.89 seconds) and fourth in the high jump (4-9). Senior Annah Stanley was second in the long jump (16-2). Senior Lilli Cusick placed third in the pole vault (10-0), while freshman Sophie Fong was fourth (10-0). Milton-Union finished sixth in the team standings with 26 points. The Bulldogs were led by sophomore Morgan Grudich, who won the long jump (16-4.75) and was fourth in the 100 hurdles (18.60 seconds). Tippecanoe finished 10th with 12 points. Sophomore Ashlyn Tarzinski was third in the discus (98-0). Piqua finished 12th with 10 points. Junior Ana Adams was fourth in the 1,600 (5:49.22), while junior Maeve Vulcan was fourth in the 3,200 (13:46.84). In the first meet of the season, Troy boys track and field coach Deon Metz was looking to learn a few things about his team. Saturday, he learned it remains a work in progress. Even with Troy not loading up its top athletes in multiple events, the Trojans still managed to finish third in the team standings with 59 points. Fremont Ross won with 84 points, while Butler was second with 67. The Trojans didn’t have any event winners, but senior Jaydon Culp-Bishop was second in the 100 (11.06 seconds), while senior Jesse Westmeyer was second in the shot put (45-11.75). Senior Noah Young placed in the top four in two events, taking third in the 300 hurdles (43.97 seconds) and fourth in the 100 (11.80 seconds). In the high jump, junior Tucker Raskay was third (5-9), while senior Caillou Monroe was fourth (5-7). Senior Spencer Klopfenstein was fourth in the shot put (44-6.5), while freshman Josh Lovitt was fourth in the 3,200 (10:32.71). Tippecanoe finished ninth with 27 points. Junior Bryce Conley won the 3,200 (9:50.49), while junior Jake Rowland was second in the 300 hurdles (43.34 seconds). Milton-Union finished 10th with 18 points. Junior Robbie Grove was third in the 200 (23.72 seconds), while senior Dalton Hetzler was third in the long jump (18-7.75). Miami East senior Blaine Brokschmidt was second in the pole vault (14-6). https://www.tdn-net.com/wp-content/uploads/sites/21/2019/03/web1_uprunning_browder-1.jpgLee Woolery | Miami Valley Sunday News Troy junior Lenea Browder won both the shot put and discus, while also setting meet records in both events, Saturday at the Up and Running Invitational at Troy Memorial Stadium. https://www.tdn-net.com/wp-content/uploads/sites/21/2019/03/web1_uprunning_jcb-1.jpgLee Woolery | Miami Valley Sunday News Troy senior Jaydon Culp-Bishop took second in the 100 Saturday at the Up and Running Invitational at Troy Memorial Stadium. 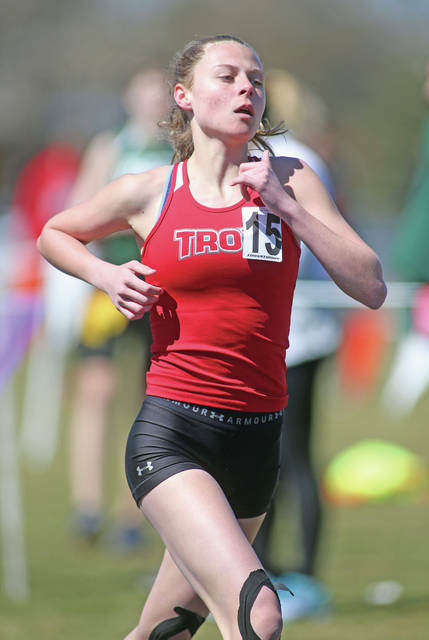 https://www.tdn-net.com/wp-content/uploads/sites/21/2019/03/web1_uprunning_kennett-1.jpgLee Woolery | Miami Valley Sunday News Troy freshman Emma Kennett won the 3,200 Saturday at the Up and Running Invitational at Troy Memorial Stadium. https://www.tdn-net.com/wp-content/uploads/sites/21/2019/03/web1_uprunning_westmeyer-1.jpgLee Woolery | Miami Valley Sunday News Troy’s Jesse Westmeyer throws the discus Saturday at the Up and Running Invitational at Troy Memorial Stadium. https://www.tdn-net.com/wp-content/uploads/sites/21/2019/03/web1_uprunning_blaine-brokschmidt-1.jpgLee Woolery | Miami Valley Sunday News Miami East senior Blaine Brokschmidt took second in the pole vault Saturday at the Up and Running Invitational at Troy Memorial Stadium. https://www.tdn-net.com/wp-content/uploads/sites/21/2019/03/web1_uprunning_conley-1.jpgLee Woolery | Miami Valley Sunday News Tippecanoe junior Bryce Conley won the 3,200 Saturday at the Up and Running Invitational at Troy Memorial Stadium. https://www.tdn-net.com/wp-content/uploads/sites/21/2019/03/web1_uprunning_robbie-grove-1.jpgLee Woolery | Miami Valley Sunday News Milt0n-Union’s Robbie Grove took third in the 200 Saturday at the Up and Running Invitational at Troy Memorial Stadium. https://www.tdn-net.com/wp-content/uploads/sites/21/2019/03/web1_uprunning_stanley-1.jpgLee Woolery | Miami Valley Sunday News Troy senior Annah Stanley placed second in the long jump Saturday at the Up and Running Invitational at Troy Memorial Stadium. https://www.tdn-net.com/wp-content/uploads/sites/21/2019/03/web1_uprunning_tyregigandet-1.jpgLee Woolery | Miami Valley Sunday News Troy’s Olivia Tyre (right) and Dinah Gigandet both placed in the top four in two events Saturday at the Up and Running Invitational at Troy Memorial Stadium. 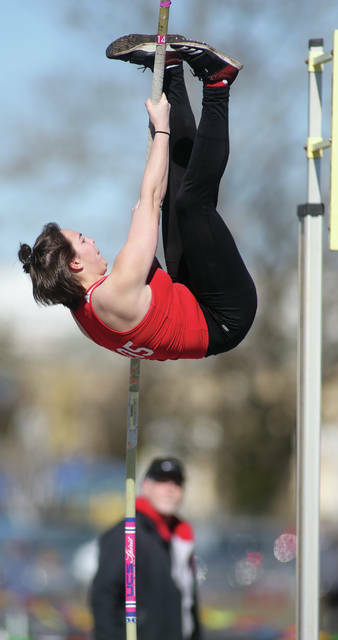 https://www.tdn-net.com/wp-content/uploads/sites/21/2019/03/web1_uprunning_cusick-1.jpgLee Woolery | Miami Valley Sunday News Troy senior Lilli Cusick placed third in the pole vault Saturday at the Up and Running Invitational at Troy Memorial Stadium. https://www.tdn-net.com/wp-content/uploads/sites/21/2019/03/web1_uprunning_goodwin-1.jpgLee Woolery | Miami Valley Sunday News Troy senior Jessica Goodwin placed second in the 100 hurdles and fourth in the high jump Saturday at the Up and Running Invitational at Troy Memorial Stadium.